Ng Lee Fung 伍李芳 was born in San Francisco on 13 July 1879, the son of Ng Dong Ming and Yee She. He travelled to Gon Hon village, Sun Ning district, China, with his parents and older brother, Ng Hock Sing, when he was nine years old. Lee Fung returned to the United States with his brother in 1900 coming through Montreal, Canada via Vancouver, B.C. From there they took a train to Malone, New York. They were arrested on 9 July 1900 for entering the U.S. without the certificate required of Chinese persons when they stepped off the train near Burke, New York and taken to jail. They were kept there over four weeks. Ng Lee Fung, age 22, and Ng Hom Sing, age 29, appeared in court with their attorney R. M. Moore with the charge of illegal entry into the U.S. Mr. S. C. Chew was their interpreter. Their uncle Ng Wai Ming, age 54, was a witness for them. He was living with his brother in San Francisco at the time of his nephews’ birth. He testified that both were born at 744 Sacramento Street. The uncle stayed in San Francisco when the rest of the family went to China and he eventually moved to the New York City area. Ng Lee Fung and his brother were found not guilty of the charge since they were U.S. citizens and had a lawful right to be and remain within the United States. They received their Discharge Certificates on 11 August 1900 following the trial by U.S. Commissioner Paddock at Malone, NY. After they were discharged they went to Newark, New Jersey. “Discharge Certificate for Ng Lee Fung, ” 1900, Chinese Exclusion Act case files, RG 85, National Archives-Seattle, Ng Lee Fung file, Seattle Box 806, 7030/12880. In 1912 Lee Fung received his Certificate of Identity #9803 at the Port of Seattle. In 1920 he submitted certified copy of the 1900 docket entries by the Clerk of the U.S. Court at Utica and certified copy of the testimony which took place before Commissioner Frederick G. Paddock at Malone, NY. He testified that he had registered for the military draft; presented his registration card showing that he was Class 1A. Ng Lee Fung visited China in 1922 and again in 1927 with his son Ng Jim. Before and after each trip out of the United States, Lee Fung submitted his documents and was interrogated. Each time his paperwork was approved. Lee Fung made his final to trip China in March 1940 at age 61. His original certificate of identity is included in the file so he probably did not plan on returning to the U.S. His wife died in Gim Sim Village, Sun Ning District, China in September 1939. Lee Fung has a thick file with many interviews, documents and photos—almost forty years of his life. 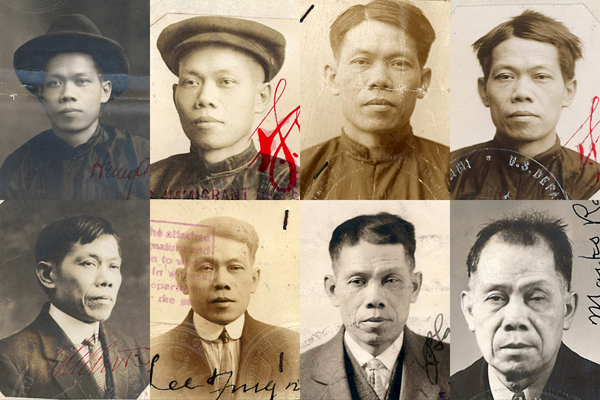 “Ng Lee Fung, photos, ” 1907, 1910, 1912, 1913, 1920, 1921, 1926, 1939, Chinese Exclusion Act case files, RG 85, National Archives-Seattle, Ng Lee Fung file, Seattle Box 806, 7030/12880. 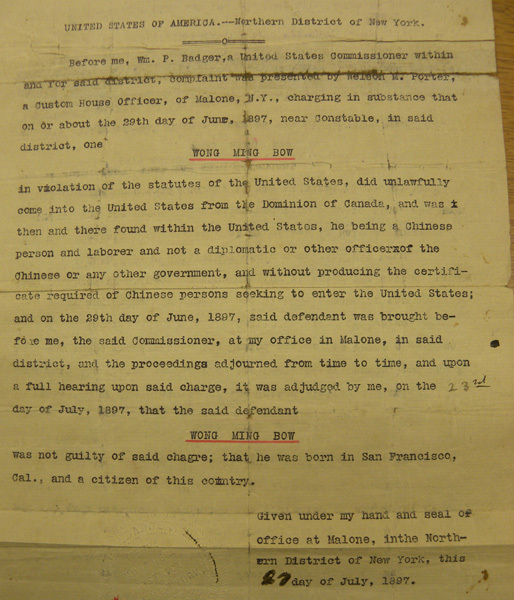 “Discharge Papers – Wong Ming Bow,” 1897, Chinese Exclusion Act case files, RG 85, National Archives-Seattle, Wong Ming Bow case file, Seattle, Box 577, 7030/4947. Wong Ming Bow was born in San Francisco about 1876. His parents took him back to China when he was four years old. In 1882 while the family was in China the United States passed the Chinese Exclusion Act. Wong Ming Bow returned to the United States in 1897 when he was 21 years old. He entered at Malone, New York and was immediately arrested. He did not have the proper papers and could not prove he was a United States citizen. Wong and about nine or ten other Chinese were held in a three-story brick building for about two months. Wong was finally issued his discharge papers by U. S. Commissioner William P. Badger at Malone on 27 July 1897. Unlike most discharge papers, his did not include his photograph. This document was the only proof he had of his citizenship. It was very precious—without it he could be deported. In an interview with Wong on 7 July 1911 he said his father came to get him when he was arrested in 1897. This is the only detail given about the 1897 arrest and it does not mention what documents his father used to prove the Wong was born in San Francisco and a citizen of the United States. Evidently it was enough for the commissioner to issue the discharge papers. In 1913 Wong Ming Bow was issued a certificate of identity No. 10150. It was a sturdy document and much easier and safer to carry around than his discharge papers. Wong’s certificate is not included in the file but to see an example see (Chin) Lin Hing’s certificate . “Wa Chong Co. Importers, letterhead” 1903, Chinese Exclusion Act case files, RG 85, National Archives-Seattle, Woo Back (Bak) Sue(y) case file, Seattle, Box 756, 7030/10966. Woo Bak Sue was born on 10 August 1884 in Seattle, Washington Territory, just two years after the Chinese Exclusion Act was passed and five years before Washington Territory became a state. His parents, Woo Tai Gap and Chew See, took Bak Sue to China when he was about five years old. Bak Sue came back to the United States through Port Townsend in the summer of 1899 when he was fifteen years old. When he arrived he was arrested, put in detention and given a hearing. A writ of habeas corpus was issued stating that he had been detained without authority of law and that he was entitled to be released on the grounds that he was a native born citizen. The order of discharge was made by Judge C. H. Hanford of the U.S. District Court, Northern Division, District of Washington. Woo Bak Sue was released after paying for the costs of his detention amounting to $25.05. He asked that his photograph be attached to his discharge papers and that the papers be certified and sent to him. He made three trips to China after 1899—1904 to 1905, 1910 to 1911, and 1915 to May 1938. When Woo Bak Sue applied to leave for China in 1903 his Caucasian witnesses were J. F. McGee and D. G. Rinehart. They both swore that they were residents and citizens of Seattle for the last twenty years and were well acquainted with Bak Sue and his parents. Woo Gen of the Wa Chong Co. sent a letter on company stationery to Thomas M. Fisher, Chinese Inspector, Office of the Collector of Customs in Port Townsend saying he would be a witness for Bak Sue if requested. When Bak Sue was returning in 1911, the immigration inspector asked him if he knew any of the Chinese at the detention house. He said he knew Woo Bing Gee. There were no followup questions asked. Woo Bak Sue’s son, Woo Sze Hong, arrived in Seattle in September 1938. His Seattle file number is 7030/11336. In October 1938 Woo Bak Sue was applying to return to China because he wasn’t feeling well. His application was approved. Bak Sue’s marriage name was Woo Gun Lum. He had a wife and six sons and two daughters in Nom On Village, Hoy San District. The village had 26 houses in three rows, facing south. He and his family lived in the 6th house, 6th lot, 2nd row. He had a grocery business there called Ow San Market.